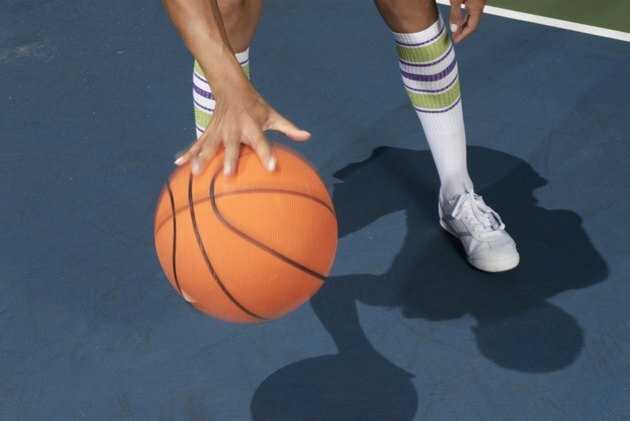 Foot-related basketball injuries may be avoided with more support for a player's arches. Players with flat feet or high arches may be more prone to injuries and need different types of arch support. You can either buy orthotics, which are arch supports you insert in the shoe, or sneakers that provide more appropriate support than the average basketball shoe. Players with flat feet need to avoid shoes with too much arch built into the shoe, as this can overstretch the arch, causing pain and possible injury. The Sneaker Report recommends the Adidas Crazyquick as the top shoe that supports the arch and keeps the foot low to the ground. It also exercises your arch to strengthen it. A player with high arches is prone to ankle injury and needs a sneaker with support in the midsole and the uppers. The New Balance Leadville 1210 or Brooks Running PureCadence 2 provide these features. Research by the sports medicine faculty at Duke University revealed that foot injuries for basketball players could be avoided by simply adding additional arch support to an athletic shoe. Both the Duke study and Sneaker Report suggest that selecting an orthotic insole is the best solution because you can buy an insole that is customized to your specific needs. Duke Report: Why All The Foot Injuries?